Nobody likes smelling ammonia throughout their home but that can sometimes happen when you have a litter box. Fortunately, there are some things you can do to neutralize urine smell. In fact, there are a number of things you can try that will help you keep that litter box odor under control. You can reduce ammonia smells by cleaning your litter box more often, using baking soda, and more! Keep reading to get our whole list of tips and tricks to get your home smelling like you want it, not like a dirty litter box. Why does cat litter sometimes smell like ammonia? Urine – including that of felines – contains a substance called urea. In itself, it isn’t very smelly, but if you let it stand for a while, bacteria will begin to break down the urea into ammonia. That urine-derived ammonia is that “smell of pee” you sometimes encounter around public urinals. It’s not dangerous or bad for your health – but it is gross. The key to getting rid of that stench? Making sure urine is either out of the box, or at least entirely dried up in clumps of quality litter. Without less humidity, bacteria will take longer to multiply and it will take longer for the box to smell. Remember that your cat has a more sensitive nose than you. Don’t try to mask the smell – just keep the box clean! Here’s how. If you’re not scooping your cat’s litter box at least once per day, this may be the problem. When urine waste builds up, so does the ammonia smell. Depending on how many cats you have, you may need to scoop your litter box even more often. The type of litter you use will determine how often it needs to be replaced. Typically, clumping litters can go longer before needing to be replaced, about every two weeks. If you’re using a non-clumping litter, you should be dumping out and replacing litter every week. This alone could get rid of that urine smell that’s lingering. No matter what type of litter you’re using, you should be deep cleaning the litter pan at least once per month. If you have issues with ammonia smells, you may want to do this every time you dump and replace the litter. Be sure to use an enzymatic cleaner. These are made with good bacteria that feed on ammonia so the ammonia is completely eliminated as they go to work. The smell isn’t just masked by the cleaner. It’s destroyed. Another option is vinegar. We have an article devoted to cleaning the litter box with vinegar. Be sure to check that out for more details. The litter itself may be the problem leading to the smell of ammonia in your home. For that reason, we recommend trying one of these odor-eliminating cat litters. These are designed to trap urine smells before they get into the air. Fresh Step Extreme is a crystal cat litter created to tackle even the most offensive litter box odors. It’s also quick-clumping which means it’s easier to keep clean and goes longer before needing replacing. This is the Arm & Hammer Platinum Clump & Seal litter. It uses baking soda in its clay litter formula to lock-in odors and has a 7-day odor control guarantee. If you prefer a natural cat litter option, then Naturally Fresh may be the one for you. It’s made with walnuts, which have naturally-occurring ammonia trapping enzymes. It doesn’t matter how often or how well you clean your litter box if the box itself is causing the problem. Over time, litter boxes get microscopic scratches in them which can trap odor-causing bacteria. We recommend replacing your litter box every year to prevent the buildup of these bacteria. These not only cause the ammonia smell, but they can also hurt your cat. Baking soda is one of the best deodorizers for your litter box. It’s safe, effective, and cheap. We believe in it so much, we wrote a whole post about why you should add baking soda to your cat’s litter box. We like the Non-Scents Cat Litter Deodorizer because it’s super concentrated so that a little bit goes a long way. It’s made with a natural zeolite formula that eliminates – rather than masks – odors. Arm & Hammer’s Litter Deodorizer uses the power of baking soda to prevent your home from smelling like a litter box. Activated charcoal is the most powerful adsorptive material known to science. It physically binds with ammonia at a microscopic level and is what Prestige Pet Magic’s Odor Eliminator uses. Something you may consider doing to help reduce the urine smell throughout your home is to add more litter to your cat’s box. Ideally, it should be between 3 and 4 inches deep. This gives your cat plenty of room to bury their waste which gives odor-fighting litter and additives time to work. 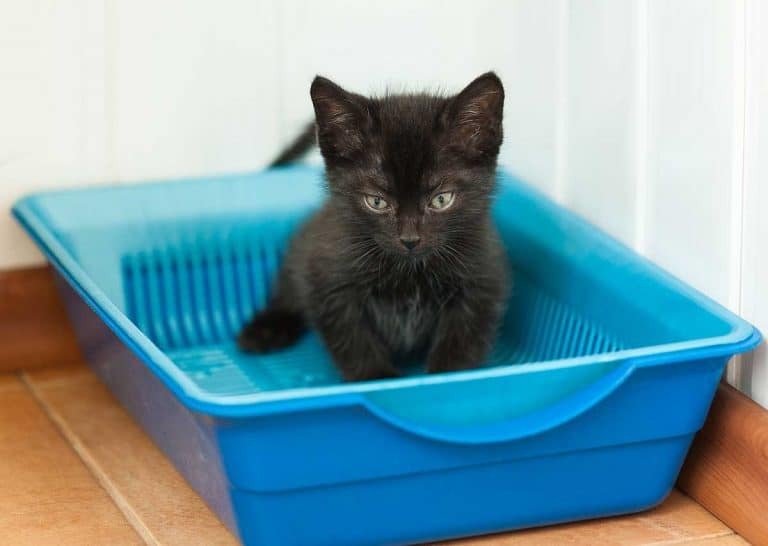 The location of your cat’s litter box may be part of the problem. If it’s in an area that doesn’t get much ventilation, the ammonia becomes trapped in that room and then spreads into the house. So, make sure you have the litter box in a location where you can have a window open to allow these smells to escape. It will also help to keep it in an area you frequent so you remember to clean it out more often. You may think that having an enclosed litter box would help eliminate litter box odors throughout your home. While that’s correct, it also traps odors inside the litter box which can lead to your cat opting to go elsewhere. Plus, you get hit in the face with them full-force when it’s time to clean it out. To avoid this and provide an expert-recommended option, use an open litter box. This allows ammonia smells to escape into the air where they won’t bother anyone. You may also want to get your cat a bigger litter box. Or, if you have several cats, this is certainly a better option. 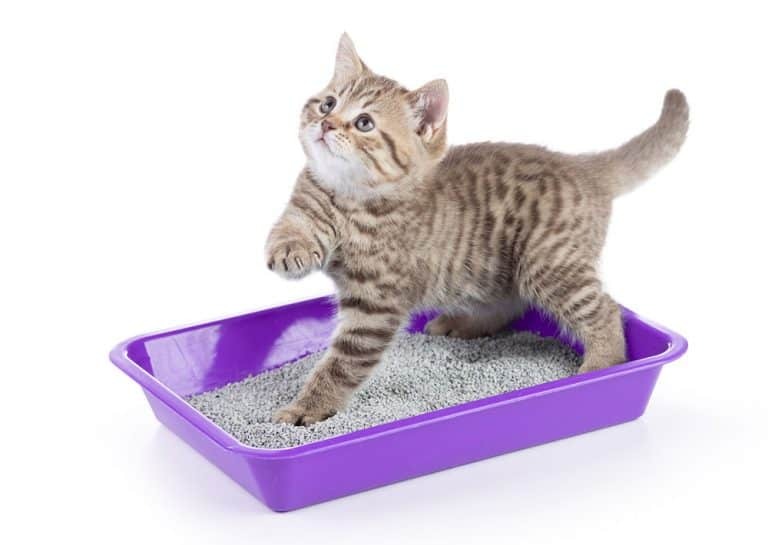 A bigger litter box provides more clean areas for your cat to use. When the wet spots are spread out rather than getting piled on top of each other, they’ll smell less. This is especially true with odor-fighting litters as it allows the litter to surround each new addition to the litter pan. Please note we did not say “air fresheners.” There’s a reason for that. Most air fresheners are designed to cover odors, not eliminate them. Plus, many of them contain chemicals that are dangerous for both you and your cat. Instead, get an air purifier that physically removed pollutants from the air. This includes ammonia and any odor-causing bacteria that may be floating around. Some are designed specifically for groomers, kennels, and other pet-related businesses which make them perfect for your home! The Germ Guardian traps everything in your air besides the air itself so your family can breathe easier. As long as it’s running, you could keep your cat’s litter box in your living room and never notice it! 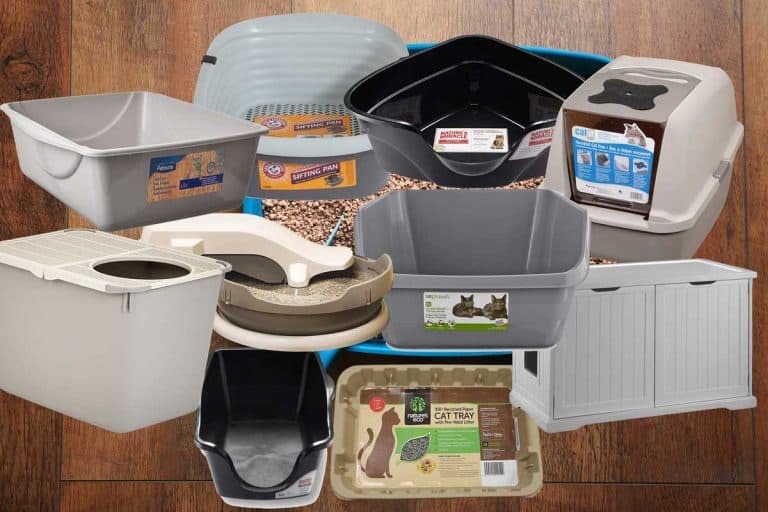 Do you have enough litter boxes for the number of cats you have? As a general rule, you should have one litter box per cat, plus one. Having the right number of litter boxes will ensure that the urine gets distributed evenly throughout the pans. This will then allow you to get to it before the ammonia starts building up and filling your home. Another thing you can add to your litter box is a carbon filter. These sheets can be laid on the bottom of your litter pan or on top of a litter liner. They use activated charcoal to trap and eliminate urine odors and can be replaced with your litter. 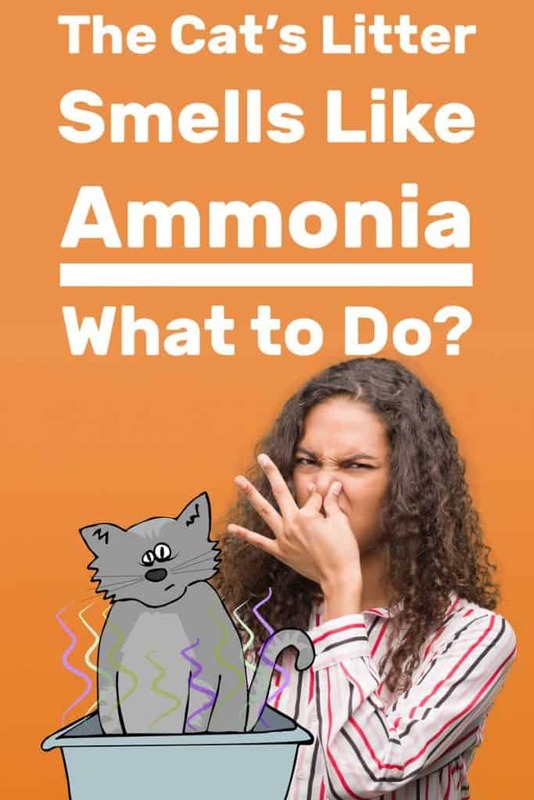 If the ammonia smell comes on suddenly and unexpectedly, your cat may need to visit your veterinarian. When the urine is more concentrated than usual, this can cause a stronger ammonia odor. Concentrated urine could be a sign of dehydration, but it could also indicate a bladder infection. Get a sample if you can and take your cat in to be checked over since a medical issue could be the root of the stronger-than-usual urine smell. Need More Tips on Reducing Litter Box Odors? Now you have 15 tips and tricks that will help you if your cat’s litter smells like ammonia. Hopefully, just following a couple of these will allow you to quickly eliminate the urine smell in your home. If you want more information on this subject, be sure to check out our blog post on litter box smells.